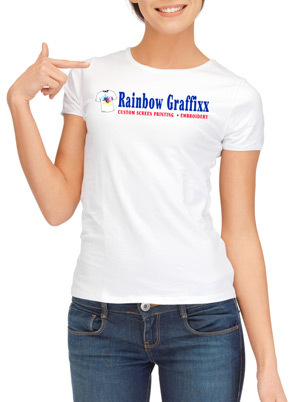 Get the Best Deals On Screen Printing from Rainbow Graffixx! Rainbow Graffixx of Mesa has been custom screen printing for over twenty-four years here in the Valley of the Sun, but not many people are aware we do more than just t-shirts! Stop by our screen printing shop in Mesa today for a tour and one of our friendly staff will be happy to show you our processes. Let us know what your idea is and we’ll walk you through each of the steps taken to make it come to life. If you have a tight deadline, tell us and our entire staff will make sure your garments are ready on time. On a tight budget, we will make suggestions in order to stay within your budget and still make a great looking finish product that you will be excited to wear. We Have Athletic Apparel Too! Simply call us directly at (480) 464-2543 to place a phone order or click here to begin shopping for your custom screen printed clothing now!